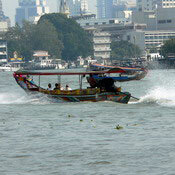 The Chao Phraya River is regarded as the bloodline of the Thai people. It has its origins in four rivers flowing from the northern region of the country, the Ping, Wang, Yom and Nan which meet at Pak Nam Pho in Nakhon Sawan Province. 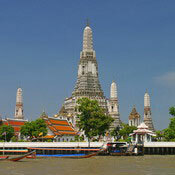 The Chao Phraya River is 370 kilometers long. 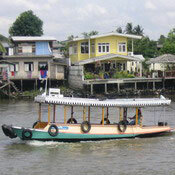 Much of Thai history can be traced along the banks of the Chao Phraya River, because in the early days Thai people settled along the river banks and only with the advent of roads in recent times have they ventured further away. 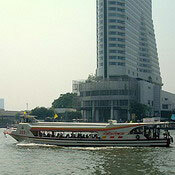 Today the Chao Phraya River remains the most important waterway for the people of central Thailand. 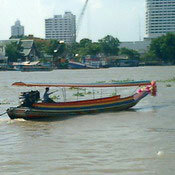 It is a working river, with daily commuter boats plying up and down from Nonthaburi to Sathorn covering 31 piers along the way. Tug boats towing three or four barges laden with sand are frequently seen as they make their way to the various construction sites down river. In the evening, as dusk gives way to night, many dinner cruise boats take their place on the river, going up as far as the Rama VIII bridge and downstream to the Rama IX bridge. 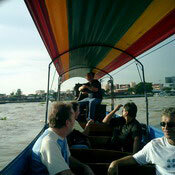 The Chao Phraya River is vibrantly interesting in the daytime and romantically beautiful at night.